Habitat: Wide-ranging: groups of 5-12. Canyons of desert mountain forests, usually near water. Range: The Sonoran and Chihuahuan deserts of southwestern Arizona, southwestern New Mexico and the Big Bend to Brownsville areas of Texas. The Coatimundi, also known as the White-nosed Coati, lives on the ground and in the trees. This member of the racoon family is omnivorous, feeding on fruits, invertebrates, and other small animals. They feed by using their long noses, poking them under rocks and and into crevices, and using their long claws to dig holes or tear apart rotting logs. 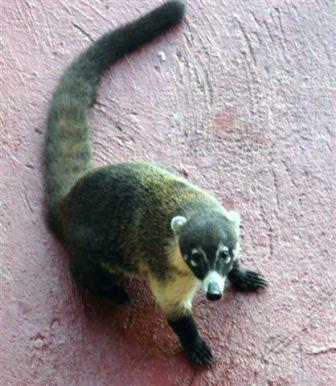 The coati is often seen in large groups of up to 30 individuals. The entiregroup will leap into the trees when surprised and make clicking and explosive "woofs" type of sounds. During the night, coatis sleep in the tree tops in nest of leaves and branches. The only other member of this species, the Brown-nosed Coati (Nasua narica) occurs only in South America.